Impress your dining guests with the bold, yet understated style of the Beth Dining Table. This table’s clean lines and avant-garde design make it an ideal centerpiece for a modern dining room, and its simple design ensures that it pairs well with many different dining chairs. The Beth’s slender block legs add distinctive contemporary artistry. Meanwhile, a 12mm-thick tempered glass top adds shine and elegance. The top is break and chip resistant, and easy to clean and care for. Use this table as a dining table, or an attractive display table. This table is so elegant. I couldn't be more pleased with this purchase. 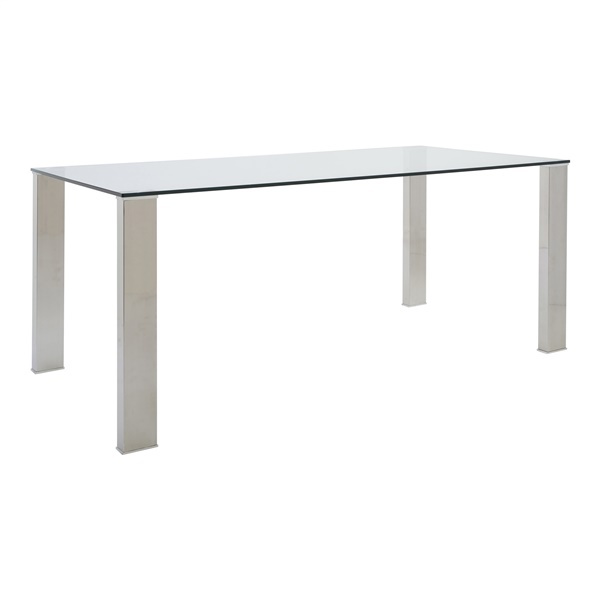 The Beth Glass Dining Table can comfortably fit up to 6 diners.